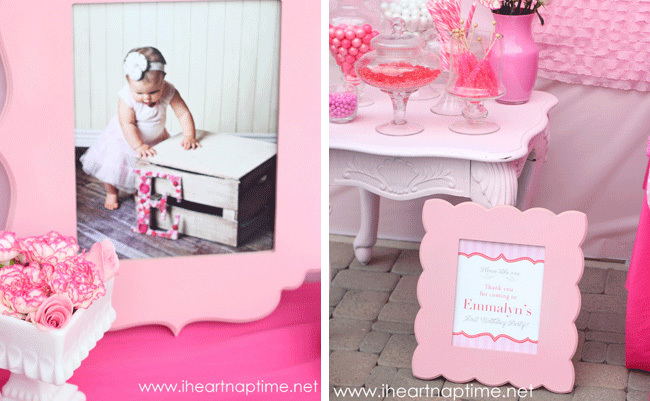 For a “Pretty in Pink” theme, only one sort of invitation will do – pink, pink, and more pink! The photo shoot for the invitation was beyond precious. The party menu included pink lemonade, club wraps, chicken croissant sandwiches, chips, veggies, fruit and strawberry dip. 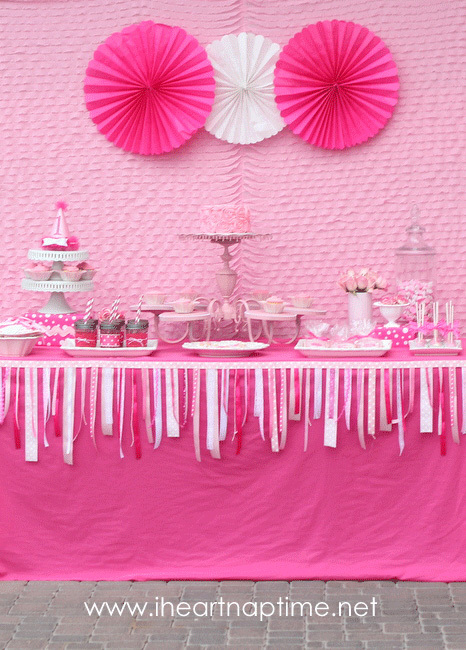 The dessert bar backdrop was made from ruffle fabric, hung with mounting tape. Pommettes from Pom Flair were added in the center to create a focal point. The ribbon banner on the front of the table is by A to Zebra Celebrations. 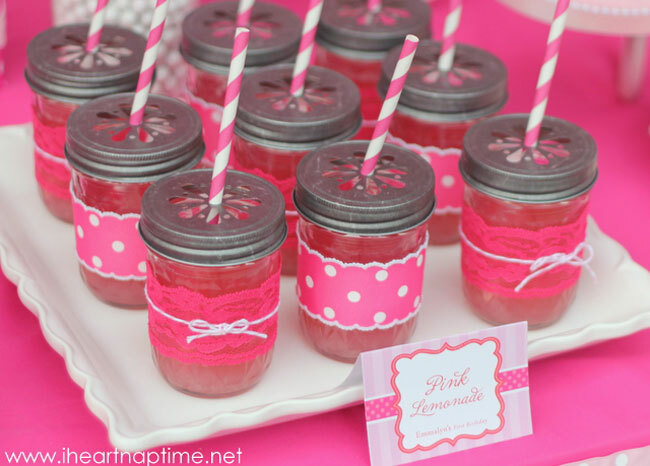 Pink lemonade was poured into mason jars topped with citrus flower lids and pink striped straws. Jamielyn wrapped each jar with ribbon, lace and twine, securing each in place with glue dots. See the mason jar cups tutorial here. Sweets included vanilla cake with strawberry filling, red velvet cake pops, royal icing cookies and strawberry cupcakes. Jamielyn turned an old nightstand (found for $2!) into a candy station. She made dollar store glass vases into pink vases by pouring pink paint inside. Then she filled them with fresh pink flowers to add to the dessert table. You can find tutorials for the nightstand and vases here. The gorgeous cookies and cakes were made by Sugar Dreams AZ. 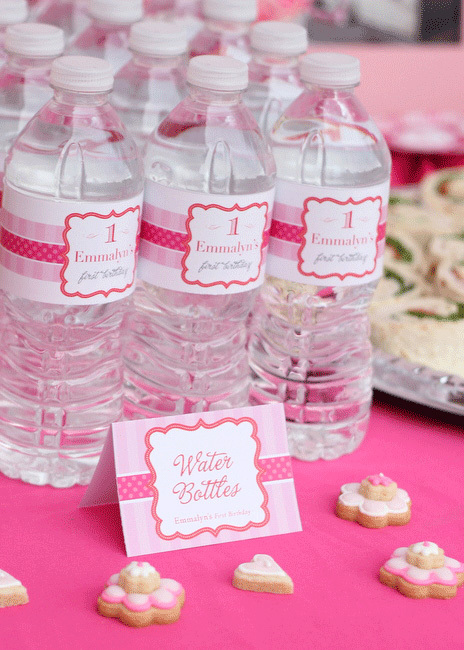 I designed the water bottle labels and DIY printable buffet cards, which are available in my shop. Emmalyn’s smash cake was iced in a beautiful pink rose design. Polka dot favor bags from Cakes & Kids Too were decorated with ribbon and a printable favor tag. 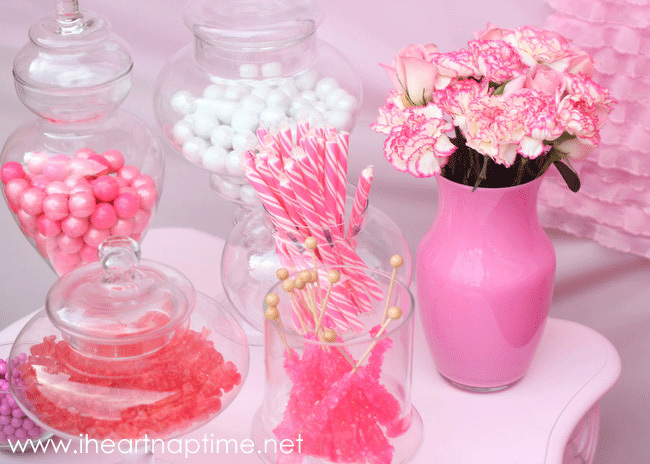 Guests filled their bags with pink gumballs, sixlets, rock candy, gummy bears, suckers and bubble gum sticks. This party has also been featured on Hostess With The Mostess, Kara’s Party Ideas, and I Heart Nap Time. 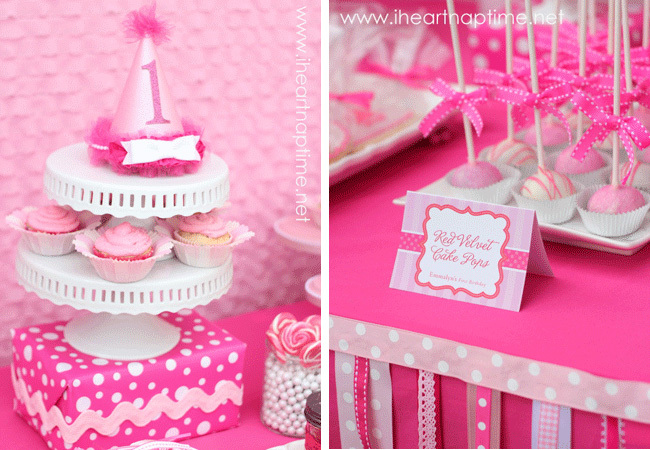 Shop for personalized “Pretty in Pink” party paper goods and printables here. 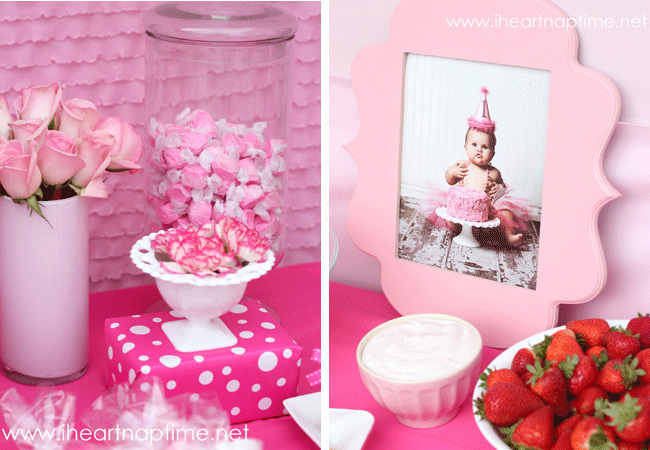 Love the sweet pink ideas! 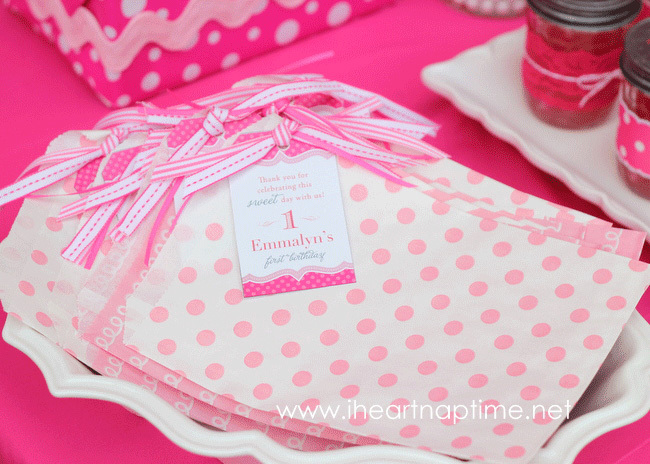 My Emmalyn is turning 1 in April and I've been looking for great party ideas. 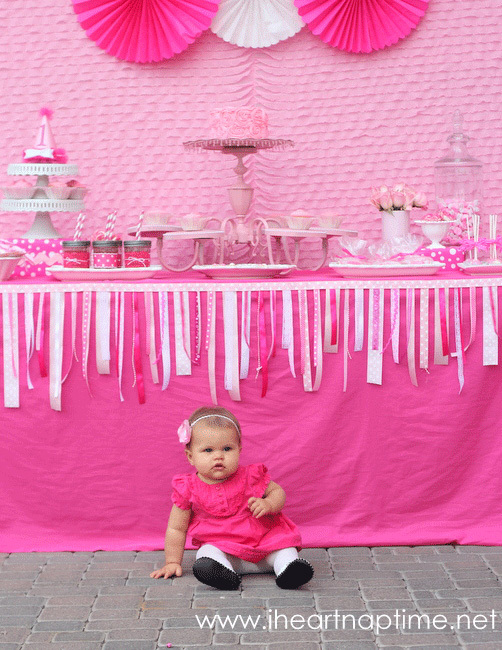 This party is the true definition of "Pretty in Pink"! This is sooooooooooooo lovely!!! Great job guys!! Awesome Job!!! 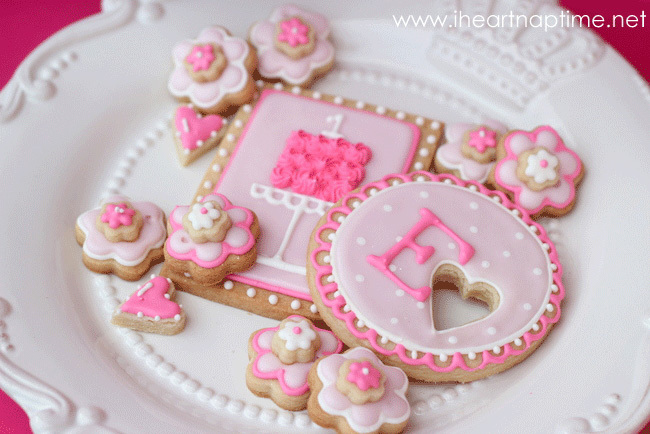 Beautiful in pink!!! The pink lemonade glasses and the rose cake are so cute! 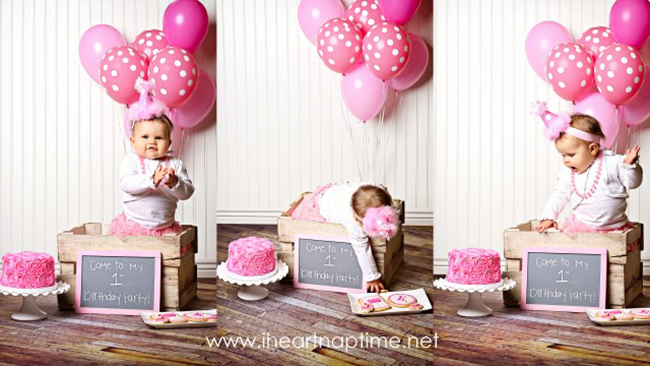 This is a great overall idea for a 1st birthday! Absolutely perfect! Where did you get the party hat and tutu? So cute! OH MY Gosh... 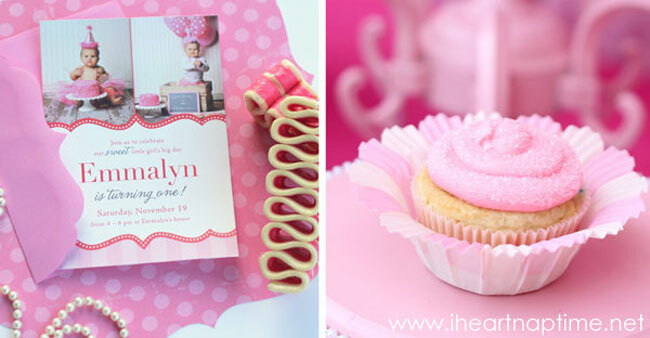 I pinned the beautiful smash cake and then just opened the link to see the name Emmalyn! Too ironic. I pinned the cake for my daughter Emmalyn's 1st bday as well. I love it! 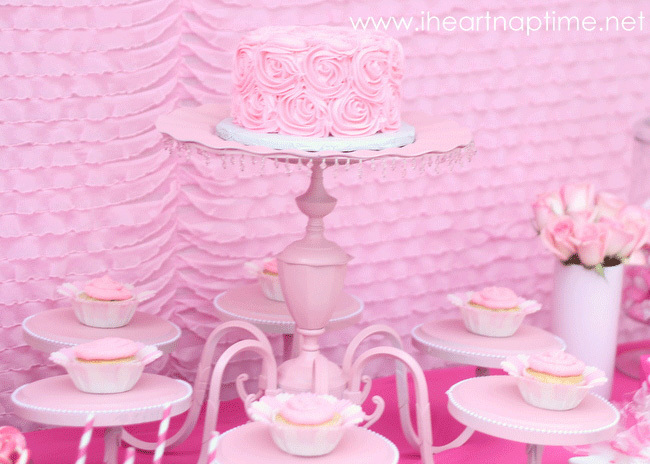 I love this theme and am using it for my daughter's 1st birthday as well. 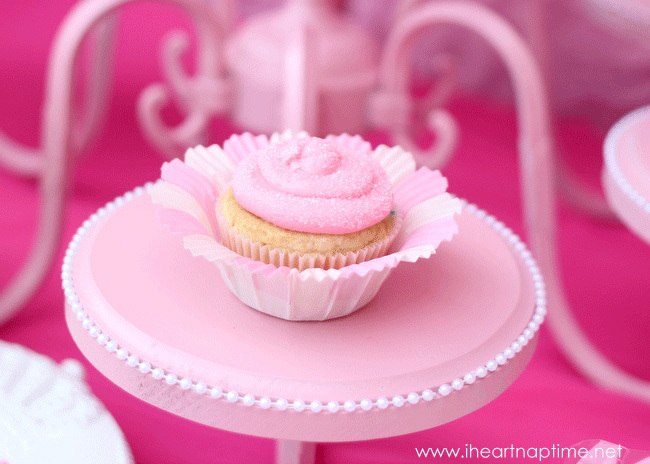 I am trying to make a cake stand for her party and pictures and am wondering if the pink dangling beads used are a strand you can buy? I have looked at all the local craft stores and cannot find anything I can use. Do you have any suggestions? Also, do you know the hats are for sale? I would love this exact party hat. Thanks! The party hat was homemade by Jamielyn (Emmalyn's mom). I am a HUGE pink and even more HUGE shabby chic fanatic! This entire party decor is absolutely to die for! 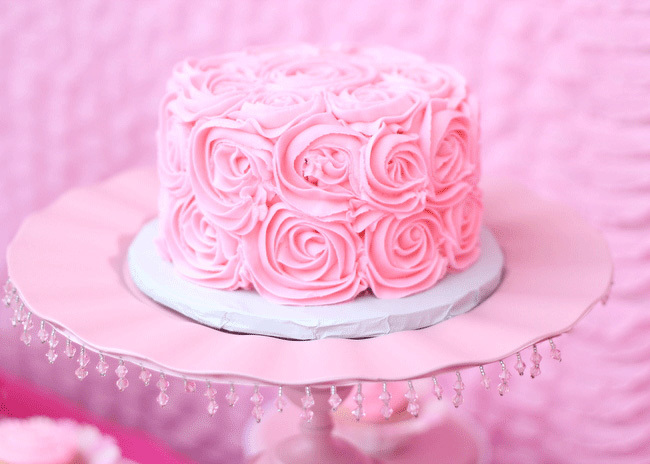 I love the rose cake! beautiful party, and your baby is a doll! 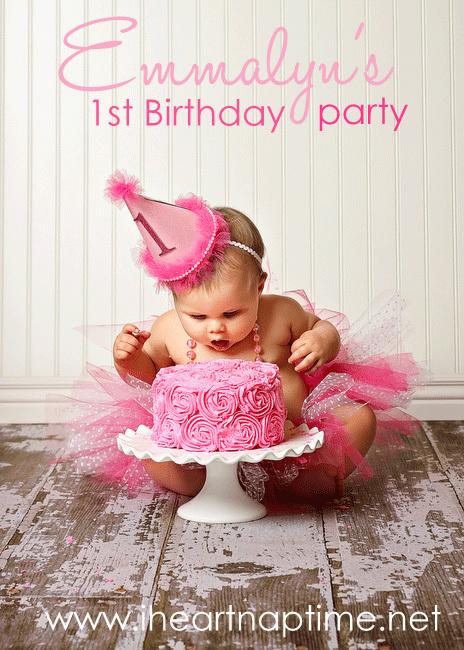 my daughter, Marin, is turning one and I'm doing the same type of party but in purple! I wanted to know where you got her headband if you can remember! thank you! I'm sorry Jennifer, I don't know where the headband came from! : \ I wish I did so I could help out! Up until this momment I thought I had the only Emmalyn. Mine is three, and a twin. Cute idea! My Emmalyn is 15 years old. I combined her name from her Great Great Grandmother Emma, and her Grandmother Mary Lynn. I love the party hat! Did you make it or did you buy it? I'm not really a do-it-yourselfer so I would love to buy the same one. Hi Jill! Unfortunately, this hat isn't for sale anywhere - Emmalyn's mom made it from scratch, adding her own tulle ruffle and pearl trim.